I recently came across this creaseless cream eye shadow by "Too Faced" called Lockdown. I had tried cream eye shadows before but hated that by the end of the day the eyeshadow had formed a crease on my eyelid--not cute. Well I tried it on yesterday for the first time and was pleasantly surprised, by the end of the night there was no crease in sight. I tried the pale pink, but it also comes in taupe, ivory, chocolate brown, teal blue, and soft pink. All the eye shadows also have a bit of shimmer. 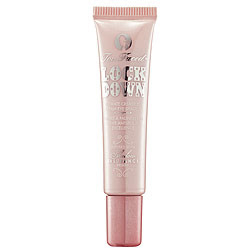 You can find it online at Too Faced.com for $18.50 or click here to find a store near you.